The continuous production of the Wapiti and its successor the Wallace served as an effective cushion for Yeovil during the lean years of the depression. Westland was a very innovative company and during the years before World War II, a number of exciting designs were flown. The most striking of these were the range of Westland-Hill Pterodactyl tailless aircraft and the very sleek Wizard monoplane fighter. 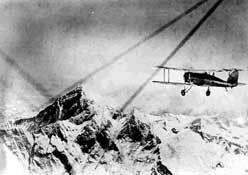 In 1933 a modified Wapiti (The Westland-Houston PV-3) flew over the summit of Everest (29,030ft). Although flying at such altitudes is now commonplace, the achievement attracted press attention comparable with the early space shots, and was indicative of an interest in high altitude flying and cabin conditioning which was to re-emerge later. Westland were also building a small powerful twin-engined fighter, the Whirlwind intended to maintain air superiority over the English Channel and Northern France. again the innovative approach was evident, the Whirlwind was armed with four 20mm cannon, neatly grouped in the nose, offering fire power well in advance of contemporary thinking. As events transpired, the capitulation of France eliminated the requirement for long range fighters, and the Whirlwind only saw limited service. 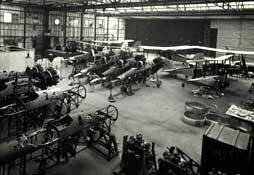 When war came in 1939, Westland were well advanced in production of the two new aircraft. Lysanders were already in service and several squadrons went to France to support the Army. They suffered badly against the Luftwaffe, leaving no doubt that the Lysander was neither intended or suited to blitzkrieg warfare. For the rest of the war they served as target towing and Search and rescue roles, but they will always be remembered for the vital part they played flying secret agents to France at night, using their unique short field capabilities to full advantage. 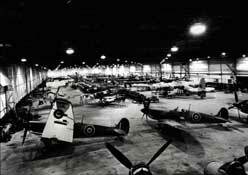 The destruction of the Supermarine factory at Southampton by German bombing brought Spitfire production to a stand still and Yeovil was one of the factories selected to recover this serious situation, within three months Spitfires were rolling off the line supported by a network of small local shadow factories which had been hastily set up in the Yeovil area. One of the most important aircraft to be produced during the war period was the Welkin high altitude fighter. It was required to combat the high flying German reconnaissance aircraft. The requirement to operate at altitudes of 40,000 ft or more called for cabin pressurisation and it was from this pioneering work that the independent company Normalair developed. The last fixed-wing design to be produced by Westland was the powerful Wyvern shipborne strike fighter, powered by a large turboprop driving contra-rotating propellers it entered service with the Royal Navy in 1953 and was used operationally during the Suez crisis in 1956.